Occupational health is an activity which deals with the protection and promotion of the health of the employees by preventing and controlling occupational diseases and by eliminating occupational factors and conditions hazardous to the health of the employees at work. It deals with the development and promotion of healthy and safe work, work environments and work organizations. The objectives of occupational health are to enhance the physical, mental and social well-being of the employees and support for the development and maintenance of their working capacities. Management of occupational health aims at the following. Management of occupational health of the employees in steel plant is ‘the science and art devoted to the anticipation, recognition, evaluation, and control of those environmental factors or stresses arising in or from the workplace, which may cause sickness, impaired health and well-being, or significant discomfort among the employees. It is essential in steel plant that an occupational health centre is established in or near a place of employment for (i) protecting the employees against any health hazard arising from work or conditions in which work is carried on, (ii) contributing towards the employees’ physical and mental adjustment, and (iii) contributing to establishment and maintenance of the highest possible degree of physical and mental well-being of the employees. Occupational health management uses environmental monitoring and analytical methods to detect the extent of employees’ exposure and it employs engineering, work practice controls, and other methods to control potential health hazards. The main purpose is to provide employees with safe and healthy working conditions. The prevention of occupational diseases calls for a multi-disciplinary approach. While health hazards are to be controlled at source by engineering measures such as enclosure and effective ventilation, there are other complementary control measures including administrative control, use of suitable personal protective equipment (PPE), education, training and supervision of employees, environmental monitoring and health surveillance. Conceptually when the healthy employees are placed on the jobs, they produce much better than what unhealthy employees produce. Larger the number of unhealthy employees, the greater is the loss to the steel plant in terms of low productivity, increasing healthcare cost, sickness absenteeism, and loss of production. The occupational health activities include the following functions. Identification and assessment of the risks from health hazards at the workplace – This is carried out by (i) undertaking workplace assessments and advising on control methods, (ii) diagnosing work-related ill health, (iii) organizing appropriate investigations for diagnosis of occupational disease, (iv) recognizing the need for specialist assessment of the working environment through use of multidisciplinary teams. Surveillance of employees’ health based on legal requirements – This is carried out by (i) pre-placement health screening and medical examinations, (ii) periodic medical examinations, (iii) other medical examinations, and (iv) biological exposure monitoring and biological effect monitoring. Surveillance of the factors in the working environment and working practices which may affect employees’ health – This is done by (i) monitoring of workplace hazards including physical, chemical, biological, ergonomic, psychosocial and other hazards, (ii) organizing and undertaking workplace inspections, (iii) organizing health surveillance for employees exposed to occupational hazards, (iv) selecting biological monitoring on the basis of criteria of validity for the protection of the health of the employee concerned, with due regard for the sensitivity, specificity and predictive value of the tests concerned. Advising on occupational health, safety and hygiene, ergonomics and on individual and collective protective equipment – This is carried out by (i) assessing control systems designed to eliminate or reduce exposure, (ii) selecting appropriate personal protective equipment with the assistance of other team members as required, and (iii) advise on the ergonomic design of the workplace and working tools. Organizing first aid and emergency treatment- This is carried out by advising on the provision of first aid facilities and emergency procedures. Advising on the planning and organization of work including the design of workplaces, the choice, maintenance and condition of machinery and other equipment, and on substances used in work – This is done by (i) advising on the introduction of new working systems and techniques, and (ii) including the human factor in the process design, workplace and working tools. Promoting the adaptation of work to the worker; assessing disability and fitness for work, promoting work ability – This is done by (i) risk assessment of workplace hazards with advice on prevention of harm, (ii) assessment of disability and fitness for work, pre placement and following work-related illness/ injury, (iii) assessment of impairment, disability and handicap in relation to work, (iv) clinical management in rehabilitation of disabled workers, (v) application of ergonomics to rehabilitation, (vi) application of organizational psychology to rehabilitation in situations of work-related mental ill health, (vii) counselling employees regarding sickness absence, (vii) management of workers with drug or alcohol problems, (viii) advising on rehabilitation and redeployment, (ix) advising on maintaining aging and disabled workers in work, and (x) promoting work ability (health, skills and training in relation to the demands of work). Advising on fitness for work and adaptation of work to the employee in the special circumstances of vulnerable groups and specific legislation. Collaborating in providing information, training and education in the field of occupational health, safety and ergonomics to management and the employees – This is done by (i) communicating with people from various backgrounds and with different levels of technical understanding, (ii) organizing and writing reports as precisely and quantitatively as possible, (iii) making clear oral presentations, (iv) counselling, (v) participating in committees, in particular the health and safety committee, (vi) participating in analysis of occupational accidents and diseases. Advising on, supporting and monitoring the implementation of occupational health and safety legislation – This is carried out by (i) application of occupational health law and ethics to individual cases, (ii) advising management on the implementation of health and safety law, (iii) advising on health and safety policy, (iv) advising employees and employees’ representatives of their legal obligations, (v) evaluation of compliance with legislation. By the management of occupational health, plant management evaluates various jobs for the potential health hazards. It determines the extent of employees’ exposure to chemical, physical, ergonomic, or biological hazards and decides what is needed to control these hazards to protect the employees. Through occupational health, management takes the help of specialists to anticipate, recognize, evaluate, and recommend controls for environmental and physical hazards that can affect the health and well-being of the employees. Accordingly they develop and implement occupational health safety procedures to protect the employees from health hazards associated with toxic chemicals, biological hazards, and harmful physical agents. A worksite analysis is an essential first step that helps in determining the jobs and work stations which are the sources of potential occupational health hazards. During the worksite analysis, the occupational health specialist measures and identifies exposures, problem tasks, and risks. The most-effective worksite analyses include all jobs, operations, and work activities. The occupational health specialist inspects, researches, or analyzes how the particular chemicals or physical hazards at that worksite affect employees’ health. If a situation hazardous to health is discovered, then there is a need to take the appropriate corrective actions. Occupational health management recognizes that engineering, work practice, and administrative controls are the primary means of reducing employees’ exposure to occupational health hazards. Engineering controls minimize employees’ exposure by either reducing or removing the hazard at the source or isolating the employees from the hazard. Engineering controls include eliminating toxic chemicals and substituting non-toxic chemicals, enclosing work processes or confining work operations, and the installation of general and local ventilation systems. Work practice controls alter the manner in which a task is performed. Some fundamental and easily implemented work practice controls include (i) changing existing work practices to follow proper procedures that minimize exposures while operating production and control equipment, (ii) inspecting and maintaining process and control equipment on a regular basis, (iii) implementing good housekeeping procedures, (iv) providing good supervision, and (v) mandating that eating, drinking, smoking, and chewing tobacco or gum in regulated areas be prohibited. Administrative controls include controlling employees’ exposure by scheduling production and tasks, or both, in ways that minimize exposure levels. For example, the management might schedule operations with the highest exposure potential during periods when the fewest employees are present. When effective work practices or engineering controls are not feasible or while such controls are being instituted, appropriate personal protective equipment (PPE) are to be used. Examples of personal protective equipment are gloves, safety goggles, helmets, safety shoes, protective clothing, and respirators. To be effective, personal protective equipment must be individually selected, properly fitted and periodically refitted, conscientiously and properly worn, regularly maintained, and replaced, as necessary. It is necessary that the management is familiar with the characteristics of the hazards in order to be effective in recognizing and evaluating the occupational health hazards and developing proper controls for them. 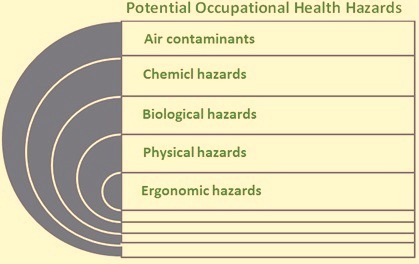 Potential occupational health hazards can include air contaminants, chemical, biological, physical, and ergonomic hazards (Fig 1). The potential occupational hazards amongst the employees are further divided into 4 categories namely (i) physical hazards that include heat, and radiation exposures, (ii) chemical hazards that include fumes dust and gasses, (iii) mechanical hazards that include back problem, muscular pain and varicose vein, and (iv) psychosocial hazards that include fatigue headache, stress and depression. Many people are exposed to common air pollutants in their occupations e.g. smoke, dust, SPM, RSPM, carbon mono-oxide, sulphur dioxide, oxides of nitrogen (NOx), hydrocarbons, and heavy metals like Pb, Cd, Cr, As, Ni etc. Their prolonged exposure causes various health hazards. Heavy metals cause acute and chronic poisoning. Some disastrous episodes have focused attention upon air pollution as a health hazard. Some fugitive gaseous and dust emissions may cause primary occupational health problems to the employees engaged in the steel plant, gaseous and dust emissions from the steel plant pose potential health risk to the populations residing in the surrounding areas. Black lung, metal fume fever, silicosis, pneumoconiosis etc. are all occupational maladies which are attributed to inhalation of one or other type of fine dust particles. Air contaminants are commonly classified as either particulate or gas and vapour contaminants. The most common particulate contaminants include dusts, fumes, mists, aerosols, and fibres. Dusts are solid particles generated by handling, crushing, grinding, screening, and heating materials such as iron ore, coal and coke, and fluxes etc. The term mist is applied to liquid suspended in the atmosphere. Mists are generated by liquids condensing from a vapour back to a liquid or by a liquid being dispersed by splashing or atomizing. Aerosols are also a form of a mist characterized by highly respirable, minute liquid particles. Fibres are solid particles whose length is several times greater than their diameter, such as asbestos. Gases are formless fluids that expand to occupy the space or enclosure in which they are confined. They are atomic, diatomic, or molecular in nature as opposed to droplets or particles which are made up of millions of atoms or molecules. Through evaporation, liquids change into vapours and mix with the surrounding atmosphere. Vapours are the volatile form of substances that are normally in a solid or liquid state at room temperature and pressure. Vapours are gases in that true vapours are atomic or molecular in nature. Harmful chemical compounds in the form of solids, liquids, gases, mists, dusts, fumes, and vapours exert toxic effects by inhalation (breathing), absorption (through direct contact with the skin), or ingestion (eating or drinking). Airborne chemical hazards exist as concentrations of mists, vapours, gases, fumes, or solids. Some chemicals are toxic through inhalation and some of them irritate the skin on contact while some other chemicals can be toxic by absorption through the skin or through ingestion. Some other chemicals are corrosive to living tissue. The degree of employee’s risk from exposure to any given substance depends on the nature and potency of the toxic effects and the magnitude and duration of exposure. Information on the risk to employees from chemical hazards can be obtained from the ‘Material Safety Data Sheet (MSDS)’ of the chemical. The MSDS is a summary of the important health, safety, and toxicological information on the chemical or the mixture’s ingredients. Biological hazards include bacteria, viruses, fungi, and other living organisms that can cause acute and chronic infections by entering the body either directly or through breaks in the skin. Occupations that deal with bacteria may expose employees to the biological hazards. Laboratory and medical personnel also can be exposed to biological hazards. Any occupations that result in contact with bodily fluids pose a risk to employees from biological hazards. Effective personal hygiene, particularly proper attention to minor cuts and scratches especially on the hands and forearms, helps keep employees’ biological hazards risks to a minimum. In occupations where there is potential exposure to biological hazards, workers should practice proper personal hygiene, particularly hand washing. Physical hazards include excessive levels of ionizing and nonionizing electromagnetic radiation, noise, vibration, illumination, and temperature. In occupations where there is exposure to ionizing radiation, time, distance, and shielding are important tools in ensuring employee’s safety. Danger from radiation increases with the amount of time one is exposed to it. Hence, the shorter the time of exposure the smaller is the radiation danger. Distance also is a valuable tool in controlling exposure to both ionizing and nonionizing radiation. Radiation levels from some sources can be estimated by comparing the squares of the distances between the employee and the source. For example, at a reference point of 10 metres from a source, the radiation is 1/100 of the intensity at 1 metre from the source. Shielding also is a way to protect against radiation. The greater the protective mass between a radioactive source and the employee, the lower the radiation exposure. In some instances, however, limiting exposure to or increasing distance from certain forms of nonionizing radiation, such as lasers, is not effective. For example, an exposure to laser radiation that is faster than the blinking of an eye can be hazardous and would require employees to be miles from the laser source before being adequately protected. Shielding workers from this source can be an effective control method. Substituting quiet work methods for noisy ones is another significant way to reduce noise-for example, welding parts rather than riveting them. Also, treating floors, ceilings, and walls with acoustical material can reduce reflected or reverberant noise. In addition, erecting sound barriers at adjacent work stations around noisy operations reduce employees’ exposure to noise generated at adjacent work stations. It is also possible to reduce noise exposure by increasing the distance between the source and the receiver, by isolating employees in acoustical booths, limiting employees’ exposure time to noise, and by providing hearing protection. It is also necessary that the employees in noisy surroundings are periodically tested as a precaution against hearing loss. Another physical hazard namely radiant heat exposure is very common in steel plants. Radiant heat exposure can be controlled by installing reflective shields and by providing protective clothing. Ergonomic hazards are avoided primarily by the effective design of a job or jobsite and by better designed tools or equipment that meet employees’ needs in terms of physical environment and job tasks. Through thorough worksite analyses, management can set up procedures to correct or control ergonomic hazards by using the appropriate engineering controls (e.g., designing or redesigning work stations, lighting, tools, and equipment); training of the employees for correct work practices (e.g., proper lifting methods); employing proper administrative controls (e.g., shifting workers among several different tasks, reducing production demand, and increasing rest breaks); and, if necessary, providing and mandating personal protective equipment. Evaluating working conditions from an ergonomics standpoint involves looking at the total physiological and psychological demands of the job on the employees. The benefits of a well-designed, ergonomic work environment result into increased efficiency, fewer accidents, lower operating costs, and more effective use of personnel. Some general health hazards are caused as a result of contact between the pollutants and the body. These hazards are (i) eye irritation, (ii) headache, (iii) nose and throat irritation, (iv) irritability of respiratory tract. Gases like hydrogen sulphide, ammonia and mercaptans cause odour nuisance even at low concentrations. High temperature can cause fatigue and dehydration. Chronic pulmonary diseases like Bronchitis and asthma are aggravated by a high concentration of SO2, NO2, particulate matter and photo-chemical smog. Carbon monoxide combines with the haemoglobin in the blood and consequently increases stress on those suffering from cardiovascular and pulmonary diseases. Dust particles cause respiratory disease. Diseases like silicosis, asbestosis etc. result from specific dust. Carcinogenic agents like PAH’s, hexavalent Cr, Cd etc. cause cancer. Hydrogen fluoride causes diseases of bone (fluorosis) and mottling of teeth. Certain heavy metals like lead, cadmium, mercury, chromium, nickel, manganese etc. enter into body by inhalation, skin absorption and through food chain. They cause acute and chronic poisoning. Mechanical systems resulting in a constant flow of fresh air would add greatly to the comfort of the operative, and would in some cases improve his output. More important is the conservation of the employees’ health, for the prevalence of dust may result in pulmonary disease. In certain manufacturing processes, the reduction of dust to a minimum should be made obligatory. More attention is also to be paid to the general cleanliness. There are two aspects of occupational health. These are (i) preventive and (ii) curative. Preventive actions consist of (i) pre-employment and periodic medical examination, (ii) removal of health hazards to the extent possible, (iii) surveillance over certain classes of employees exposed to special risks, (iv) emergency treatment for accidents, (v) training of the employees in first aid, and (vi) education of employees in health and hygiene. The curative aspect begins once an employee suffers from ill health or disease. While the curative side can be attended to, the basic difficulty associated with the preventive aspect is the general economic condition in the employee. There is a general fear among employees that a medical check-up may result in disqualification for continuing in employment if something adverse is detected. In sum, occupational health encompasses a broad spectrum of the working environment. It is an integral part of a healthful work setting. Management is to place a high priority on using occupational health concepts in the plant since by recognizing and applying the principles of occupational health to the work environment, the workplaces in the plant become more healthful and safer.